I am a father. I have two sons. Have you seen this image on Facebook? Except, one thing bothered me. I know that in giving parts of himself, Ken is not left with holes. Ken is fulfilled. That’s just how Ken is, and I can’t imagine him any other way. I have “given” things as a father. According to articles I’ve read, having kids is super expensive… to the tune of hundreds of thousands of dollars per kid. I think those numbers are ridiculous… have these journalists/researches ever bought anything on sale? Or at a consignment store? I’m not saying you have to be cheap with your kid, but you can spend a couple of bucks to get your kid a brand name shirt (which I think wear nicer than new cheap no-brand clothes) at a thrift store instead of $20, $50, or more from a normal store. Sorry, this really isn’t a post about disputing the ridiculous “cost” of having a kid… or at the least the articles that seem to be written to scare people away from having kids, because they are unaffordable. I want to talk about the image above, where a dad gives himself to build (or compensate for differences) his sons (and really, daughters). I love the message. But something is… missing. When I think about the times I’ve given of myself to my kids, I don’t think that it is taking a part of me, at all. Ever. Oh sure, there was the time when we changed the sheets four times during one night because our baby kept throwing up… the first three were in her crib, the last time was in our bed (bleh!). I gave up deep sleep, but really, how would anyone NOT give that up for the health, safety, and comfort of their child? Yeah, there was the time where I gave up my clothes, again and again, when a kid somehow got them messy. From spit up to throw up, I’ve changed my shirt more than once. Small sacrifice, I guess. I’ve given up my time, my “guy nights,” and plenty of money (which isn’t “mine,” It’s more like “ours”). Understand, I don’t look at my life and think that, or feel like, I have given up much. As I think about it, I honestly can’t think of a time when I have given something that I regret. Let me put it another way, because this is not about giving and regretting. Anytime I have given to my kids, I feel like it was giving to me. As a dad, when I give, I get. I get fulfilled, I get joy. The miracle of giving, just like loving, is that you are not eroding. You are adding. You are not adding, you are multiplying. 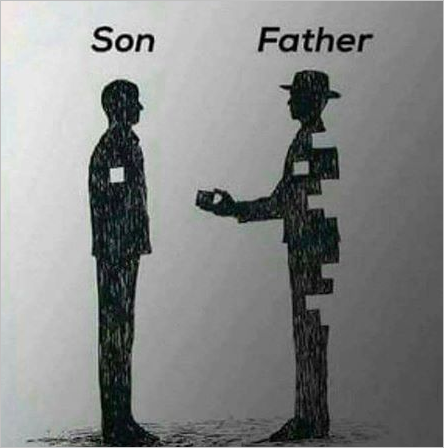 I love the picture, but I wish it somehow showed that the sacrifice doesn’t result in a father that is becoming nothing, rather that he is getting so much more than he ever gave. This entry was posted on Tuesday, February 14th, 2017 at 7:16 pm	and is filed under Parenting. You can follow any responses to this entry through the RSS 2.0 feed. You can leave a response, or trackback from your own site. Where did you get this image? I’d like to find the owner and get permission to use it. It’s all over facebook. If you find the owner let me know who it is.